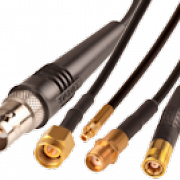 Adapter Cables connect your Spectrum card or instrument with your device under test, your sensor, your transmitter or receiver, your external machine, your prototype equipment or simply with a probe for measuring. To fulfill a lot of different requirements Spectrum is offering adapter cables between different types of connections and with different length. These adapter cables are manufactured for Spectrum following Spectrum's specification. The type and number of your cables depends on your selected Spectrum product and the equipment you want to connect. To get an overview about the available connections on your specific instrument please go to the specific instrument page, switch the tab page to "Accessories & Cables" and follow the link to the adapter cables page that matches your product. An easy way to find your instrument is also the search field on top of this page. Just type the number of your instrument (4934 or 6030 or 7010) and select the matching type from the product list that is shown. What adapter cables are available? There are plenty of different types of adapter cables available. If you don't find the connection combination you need or need another length please get in contact with our sales team to discuss an individual cable solution.